Wild garlic is back in season. It catches me off guard every spring. Just a month ago there was no sign of it. In another month or so it will retreat beneath the ground, not to be seen again till next year. I rejoice at its reappearance, grab my basket, don my boots and set off to harvest the elegantly tapered, fragrant leaves. Wild garlic has always been associated with bears, as witnessed by its Latin, German and French names (Allium ursinum, Bärlauch and ail des ours, respectively). Seems that these hibernating animals are extremely partial to this garlicky member of the allium family, which emerges conveniently from its winter slumbers just as the bears are coming out of theirs. 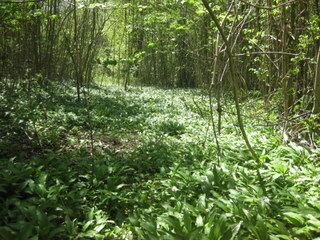 Bears are few and far between in our upper Rhine region nowadays, but the rest of us greet the re-emergence of wild garlic joyfully each spring. Somehow at the tail end of winter – especially this long and tedious one – we tire of rich, rib-sticking stews and stodgy roots, and start to crave fresh spring greenery. Wild garlic (along with dandelion leaves, sorrel and the first tentative spears of asparagus) answers the need perfectly. Restaurant menus throughout Alsace, Baden (Germany) and Switzerland suddenly sprout a rash of soups, sauces and salads based on the pungent green leaves. No self-respecting farmer’s market would ever be seen without at least a few small bunches for sale. There are loads of ways to use these special spring greens, which have a distinct but not overly powerful garlic flavor. For a vibrant green, herby butter that will melt deliciously into steak, lamb or a firm fish like monkfish or turbot, finely chop a handful of leaves in the food processor and work in half a cup of softened butter, the juice of half a lemon and a pinch of salt. Or whip up a batch of wild garlic ‘pesto’ (pace the purists in Liguria, for whom pesto is made exclusively with basil) with toasted walnuts or hazelnuts, Parmesan and olive oil. Alternatively, add a handful of very finely chopped leaves to your customary pasta recipe – wonderful with creamily set eggs and diced bacon (à la carbonara) or with ‘lamburgers’ made from trimmed shoulder of lamb. And if you’re into home baking, make a fragrant, green-flecked bread by adding a handful of finely chopped wild garlic to any basic wholewheat bread recipe. 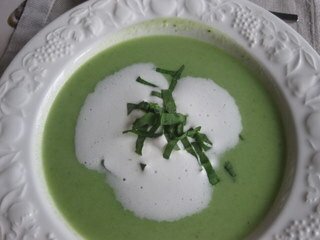 Perfect with a bowl of soup, such as the one below, and a hunk of aged Cheddar cheese. At a recent grocery store visit, I stumbled across fresh Baerlauch and immediately thought of you. I thought…how would Sue use this in an entree? I went ahead and purchased the herb and made a mental note to check your website. Thank you for posting the Baerlauch soup recipe. I will prepare this dish for my next cooking get together with friends. Conveniently the theme will be “Simply Delicious – Herbs”. I really enjoy reading your posts. Thank you. Hi Amanda – great to hear from you and I’m happy that the Baerlauch post was so timely. Amazing that it’s now readily available in the stores, in case you don’t have time to get out in the forest 🙂 Enjoy the soup – and try out that sauce too, great with fish. Come back for another workshop any time! Dear Sue, I would very much like to attend another workshop hosted by you. I did look at your workshop schedule for Spring, but unfortunately, I have conflicts with all of them. Do you plan to offer a workshop in June? Somehow I remember you offered a course in June last year. If not this Spring, then I will join you in the Fall. Hi Amanda – am tentatively planning a workshop for either Thursday 13 or Friday 14 June: sunny summer stuff from around the Mediterranean – any good for you? Both days are open for me at the moment, but the 13th is probably better. I could ask around to see if some of my friends would like to join as well. Would that be okay? I put the words out to friends about the 13th. I will let you know. I am certainly attending. Thank you. perfect! Sure we can find enough folks, will also do some scouting around from here.